********************IF ORDERED AFTER DECEMBER 21ST 1PM EST, YOUR CANDLE WILL NOT ARRIVE IN TIME FOR NEW YEARS EVE!!!!!!!!!!!!!!!! 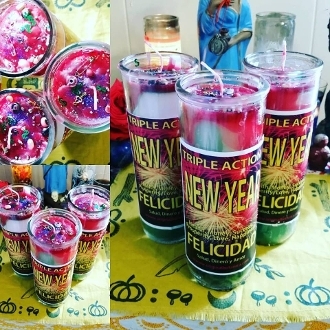 Extra large prayer candles filled with good fortune scrolls, pyrite, lucky keys, evil eyes, pyrite, essential oils, black eyed peas for good luck in the new year, lucky 7 bean mix, iron filings, bits of cash, a safety pin to pin down your goals and so much more! This candle weighs over TWO pounds AND you will also get a bottle of my Happy New Year oil inluded! ***Candles may not be received by new year's eve due to the holidays.